Proponents of medically supervised, indoor sites for opioid injection say such places would be much safer than tent encampments like this one — and could help people addicted to opioids transition into treatment and away from drug use. The mix of people in rows of tents under a bridge in Philadelphia's Kensington neighborhood includes homeless adults and some visitors from the suburbs who come here to inject opioids in secret. Top Philadelphia officials are advocating that the city become the first in the U.S. to open a supervised injection site, where people suffering from heroin or opioid addiction could use the drugs under medical supervision. But the controversial proposal aimed at addressing the city's deadly drug crisis must first overcome resistance from top city police officials, community residents and the federal government. It's a divisive idea: People bring their own drugs to shoot up under the watch of medical staff, in a facility that provides clean needles and other equipment. Advocates say the goal is to provide a bridge to treatment. There are about 90 such official facilities around the world. Though some U.S. cities — including Seattle, San Francisco and Denver — are talking about establishing this sort of city-sponsored site, there are none in the United States, so far. Philadelphia may be unusually well-positioned to be the first; its opioid crisis is mostly concentrated in one neighborhood, where some of the purest, cheapest and most deadly heroin in the nation can be purchased. The city's new district attorney, Larry Krasner, has promised he would not prosecute users at the safe-injection site. "Supervised injection sites are a form of harm reduction," says Krasner, who was sworn into office just last week. "The only way to get people to turn their lives around," he says, "is to keep them alive long enough so they can do that. And we're going to do that." Philadelphia's Mayor, Jim Kenney, says he soon will make a public announcement on the topic of establishing a supervised injection site — but, so far, he has not provided details. Sources close to Kenney say he is still working to bring skeptical members of his administration and other opponents on board. Kenney has been working on Philadelphia's drug problem for months, first launching a task force to combat the opioid crisis, then creating a new position in city hall to coordinate so-called harm reduction initiatives. Other plans underway include establishing rules for doctors to more safely prescribe opioids; public education campaigns aimed at combating the stigma around usage of the drugs; and ensuring that those whose overdose is reversed in an emergency room are put directly into treatment — what's known as a "warm handoff." "I would absolutely go there," Johnny says, adding that he recently relapsed after being sober for seven years. "Every shot — you never know what's going to happen," he says. "It can always be your last one." On his lunch breaks from work, Johnny says, he often travels to Philadelphia's Kensington neighborhood — the epicenter of the city's opioid crisis — to use drugs. 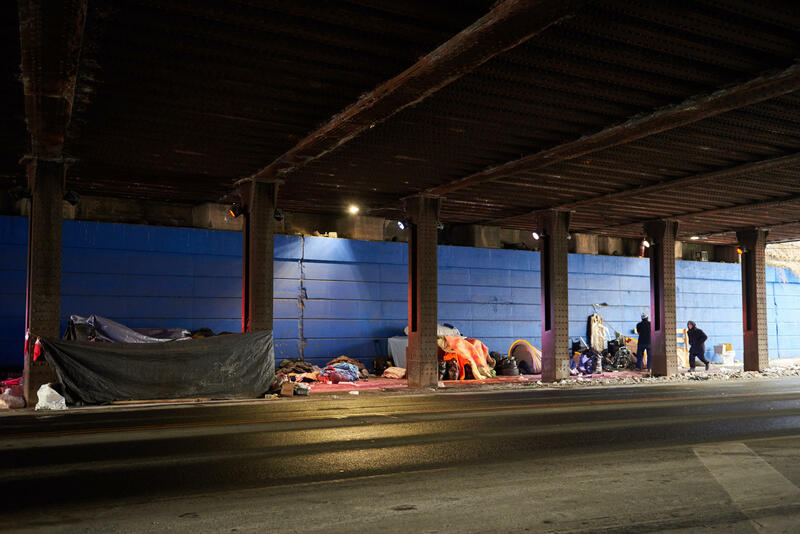 Recently, a sprawling open-air drug market and homeless encampment in Kensington along decommissioned train tracks was cleared out, prompting droves of opioid users to regroup in smaller pockets under bridges, in alleyways, on the streets and in abandoned buildings. Under one of those bridges recently, there was a row of tents. 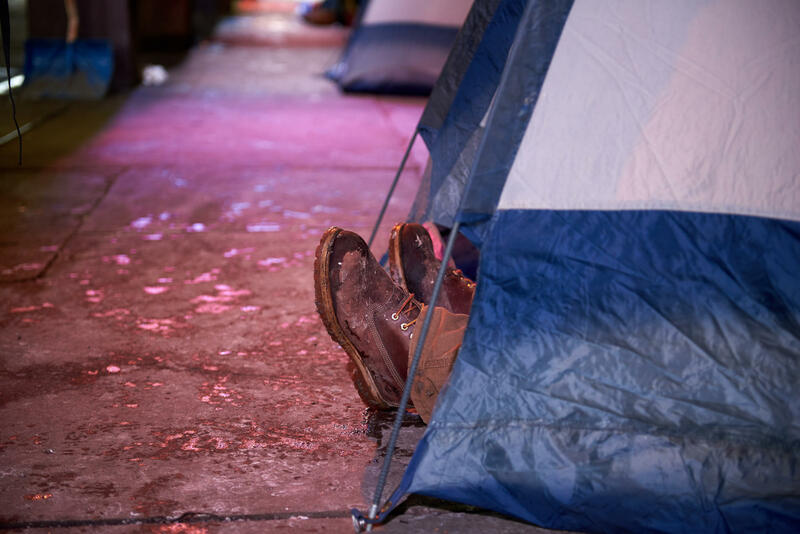 Many people live there, and some visitors, like Johnny, use the tents as a private place to do heroin. He says he would rather inject his drugs in a medically supervised facility, and he thinks Philadelphia residents would prefer that, too. "People are not going to be shooting up on your front stoop" he says, "or in your back yard, hiding. It will cut down on people dying in abandoned houses around here — or even here." He motions to the tents. "They come down here and get high and die here under a bridge." But some law enforcement officers have a different view. Philadelphia's police commissioner, Richard Ross, has been skeptical about designating a legal place for the use of an illegal narcotic. And even if local police can be convinced, the proposal is likely to provoke a standoff with the federal government, which has promised to aggressively crack down on similar plans in Vermont. Patrick Trainer, a special agent with the Drug Enforcement Administration's Philadelphia field office, says he is no fan of the model. "The concept, for us, with safe injection sites, is just not a concept we can get behind," Trainer says. Such a site could attract street drug dealers and increase their sales, Trainer worries. More than that, he says, the federal government is leery about looking the other way in the face of drug use, worried about where that first step might lead. "Is it going to stop with a safe injection site?" he asks. "Are we going to do that and then, next year and the year following, are we then going to be talking about, OK, there are still overdose deaths, so maybe we need to look into government-supplied drugs?" Jen Bowles, a researcher now at the University of California, San Diego, who has studied opioid use in Kensington, says research in other cities has shown that safe injection sites actually decrease fatal overdoses and do not cause a spike in crime. "There's a tremendous fear that says, 'If we create a space in which drug users can more safely consume drugs, that may somehow be encouraging drug use,' " Bowles says. "But that conflicts with the science that finds that not to be true." Still, evidence-based studies don't change all minds. No Kensington residents agreed to speak out publicly for this story, since the exact proposal is still being hashed out. Some, though, say the idea of a safe-injection site makes them uneasy. Winning the support of the community will likely be another battle. Nonetheless, the statistics are creating new urgency. Opioids were the main driver in what officials believe were 1,200 drug overdose deaths in Philadelphia last year. That's four times the city's murder rate. Standing along the row of tents, Johnny thinks he has a good counter-argument for those troubled by the notion that opioid injections by people like him can and should be made to be safer, and that the city should play a role in making that happen. "Someday their children could be out here using," he says. "Wouldn't they want their children to be in a safe environment if they're not able to beat the disease?" Philadelphia is looking at a new tool to fight opioid addictions - supervised injection sites. That's where people can safely inject heroin or other opioids under medical supervision. It would be the first such site in the U.S., as Bobby Allyn of member station WHYY reports. BOBBY ALLYN, BYLINE: It's a divisive idea - letting people shoot up with clean needles and their own drugs while under the watch of medical staff. Advocates say this form of harm reduction can be a bridge to treatment. There are 90 such facilities around the world, and Philadelphia might just be uniquely positioned to host the nation's first. Opioids were the main driver in what officials believe were 1,200 drug overdose deaths in Philadelphia last year. That's quadruple the city's murder rate. LARRY KRASNER: Supervised injection sites are a form of harm reduction. They've been proven to be very important. ALLYN: That's the city's new left-leaning district attorney Larry Krasner, who was sworn in last week. If a safe injection site opens, he's promised not to prosecute drug crimes there. To backers, that's huge. KRASNER: The only way to get people to turn their lives around is to keep them alive long enough so they can do that. And we're going to do that. ALLYN: Sources close to Philadelphia Mayor Jim Kenney talk about him favoring safe injection sites. But publicly, Kenney says he's still studying the issue. Thirty-nine-year-old electrician Johnny (ph) from Philadelphia suburbs hopes the mayor will soon be outspoken about supporting an injection site. JOHNNY: I would absolutely go there. ALLYN: We're withholding Johnny's last name since he uses illegal opioids. He's standing under a bridge in the neighborhood Kensington, the heart of the opioid crisis and the likely location of a safe injection site. On both sides of the trash-strewn road, there are long rows of ragged tents. Visitors like Johnny use the mini-encampment as a private space to do heroin. He says he'd rather use a medically supervised facility. JOHNNY: People aren't going to be shooting up on your front stoop, you know, or in your back yard, hiding or even here. You know what I mean? They come down here and get high, and they die here, like, under a bridge. ALLYN: Others would prefer to fight the epidemic with handcuffs. Philadelphia's police commissioner has been skeptical about designating a place for the use of an illegal narcotic. And even if local police can be convinced, the proposal is likely to provoke a standoff with the federal government, which has promised to aggressively crack down on a similar plan in Vermont. Patrick Trainer is a special agent with the Drug Enforcement Agency's Philadelphia field office. PATRICK TRAINER: Are we going to do that? And next year - the year following, are we then going to be talking about, OK, well, there're still overdose deaths, so maybe we need to look into government-supplied, you know, drugs? ALLYN: Yet supporters of safe injection sites say when people consume drugs alone, they're more likely to die of an overdose. Jen Bowles' research backs this up. She's studied the opioid crisis in Kensington at Drexel University. JEN BOWLES: There's a tremendous fear that says if we create a space in which drug users can more safely consume drugs, that that may somehow be encouraging drug use. But that conflicts with the science that has found that not to be true. ALLYN: And another study in the journal The Lancet found that overdose deaths around a safe injection site in Canada dropped 35 percent around the facility after it opened. Despite that evidence, the safe injection site is still likely to be a tough sell for Kensington neighbors. Standing along the row of tents, Johnny says he would make this case to those troubled by the idea. JOHNNY: Someday, their children could be out here using. Wouldn't they want their kids to be in a safe environment if they're not able to beat the disease? ALLYN: As the safe injection site debate goes on, the city has other initiatives underway - from education campaigns trying to end the stigma around opioid use to making sure overdose-reversing drugs are in the hands of more people. For NPR News, I'm Bobby Allyn in Philadelphia. (SOUNDBITEOF JOY WANTS ETERNITY'S "DEATH IS A DOOR THAT OPENS") Transcript provided by NPR, Copyright NPR.